Dry Graphite Lubricant, Dry Lubricant, Hi Temp Graphite Lubricant â€“ Heavy Equipment â€“ Mining - Construction | Superior Industries, Inc.
A fast drying 100% graphite lubricant that disperses evenly on all surfaces. GS 1100 forms a thin black, anti-seize and anti-friction film. GS 1100 provides excellent lubrication for all metal on metal applications. Consistent Under Extreme Pressure. Use where a dry lubricant is essential and petroleum products must be avoided. Tracks, bearings, conveyor parts, flat springs, hinges, switches, couplings, die casting machines, lock mechanisms oven parts, automotive and industrial gaskets, cables and open gears, thread lubricant (anti-seize), all metal to metal friction, internal combustion engine components (assembly and break-in) and all pre-assembly operations where dust and dirt free lubrication is required. EXTENDS LIFE OF GEARS, CHAINS, THREADED CONNECTIONS, BEARINGS AND MORE! 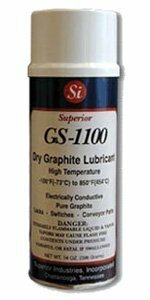 A graphite lubricant, GS 1100 is a dry lubricant with a pure graphite base. The graphite is deposited using a solvent based carrier which evaporates after penetration. GS 1100 is among the finest of all graphite lubricants. This hi temp graphite lubricant product can withstand extreme pressures, high temperatures and continues to provide outstanding lubricating qualities. This graphite lubricant is packaged in a convenient to use aerosol can making it most desirable for use in many types of industrial applications. This dry lubricant product has shown excellent results when used as an anti friction and anti seize film. GS 110 is considered a conductive lubricant and is widely used where conductivity is required. It is a fast drying dry lubricant and provides a dry film where wet type products cannot be used. GS 1100 is heat stable from -100°F (-73°C) to +900°F (+474°C). No other product can be in such vast temperature extremes. In addition, metal to metal friction is eliminated where this material is deposited. Graphite is considered one of the finest lubricating compounds known, and this graphite lubricant employs a pure version making it suitable for extreme pressure and extreme temperature lubricating requirements. GS 1100 is excellent for use on cast iron, copper, brass, steel alloys, aluminum and titanium. It offers long term protection even when exposed to steam, dampness and salt spray. It reduces friction and is excellent as a sealant for making tighter joints. It also prevents the formation of rust and corrosion and provides long term lubrication. GS 1100 is recommended for use on metal, plastics, glass and rubber. It is also an excellent die release compound where anti seize properties are required. 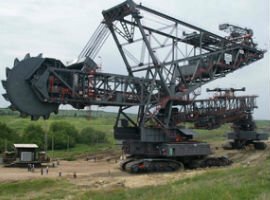 GS 1100 has shown excellent results when used on heavy equipment in the mining and construction industries. 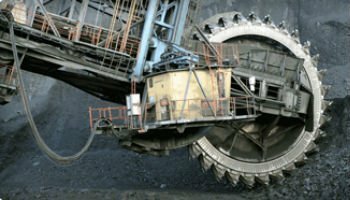 Drilling equipment requires the finest lubricants and GS 1100 graphite lubricant is the product of choice for this and many other type lubricating requirements.